Last week, the latest issue of our newsletter went out to all of our faithful subscribers. Among other news items, the issue included some important news about new purchase features and discounts that are available on our re-vamped website. As we mentioned in the newsletter, we all love our brick-and-mortar bookstores. And plenty of our readers are equally enthusiastic shoppers via online bookselling sites. 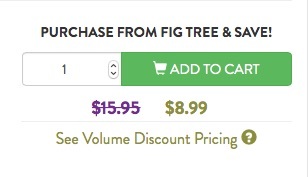 But at the same time, many of you—especially those of you in book clubs and groups—have asked us about direct sales straight from Fig Tree. We are delighted that we are now able to offer direct sales via our re-designed website. And there’s a decided bonus: We’ll be able to offer you significant discounts. All of our available titles are catalogued online. As you click on any book’s individual page, you’ll find information about its direct sale price and be able to place an order right then and there. You’ll note that we’ve already discounted the retail price for each book. And remember that bonus we mentioned? Volume discounts also apply. Purchasing five or more books? You’ll get an additional 10 percent off the price of each book. Even better, the volume discount rate applies whether you’re purchasing five (or more) copies of the same title or a mix of our books. Sure, this new capability involves a little more work (and administrative cost) for us at Fig Tree. But we’re doing it because you’ve asked us to. We want to make all of our reader-customers happy. We hope that we’re doing exactly that. One final note: We have always offered discussion guides to help kick off the conversation in your book group or club. Those guides remain available on the new version of our site. Just click the “Book Clubs” tab on each book’s page. Easy!